With real life bring filled with what seems like more bad than good lately, I enjoy finding stories that remind me that there is still some good out there. 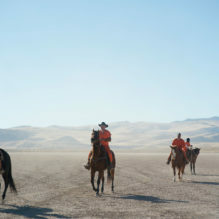 At the beginning of The Mustang you hear of one of those stories involving the titles namesake, an animal that has roamed the American plains, but because of privatization of land their roaming areas are dwindling. Enter in a program to help with population control and along the way brought some help to the most unlikely of people. Roman (Matthias Schoenaerts) has served most of his prison term in solitary confinement, but that’s about to change as he is being introduced back to the general population. This is not something Roman wants and because of his not wanting to be around people he takes an outside maintenance job as his work duty. It is during that job he notices other prisoners training horses and when he shows some interest, Myles (Bruce Dern) tells him he is in the program. Early on though his overall anger at the world shows up in the training process, which causes him to get kicked out of the program. It is only after a storm and when Roman shows some new skills at training horses does Myles give him another chance. During the training, Roman seems to find an inner peace and a connection with another living being that starts to carry over in the rest of his relationships. With the main one being his daughter, who for the first time tries to include her in his life instead of pushing her away. By the end of the story you find that this program has done good things for both parties involved and that even someone at the darkest point can find the light. For me I feel like we need more stories like this in the world to counter all the negative ones we hear everyday. I enjoy hearing how people can change for the better and that there is hope out there. With The Mustang written by Mona Fastvoid, Brock Norman Brock and Laure de Clarmount-Tonnerre, the later also directing tells a story that is simple and straight forward and doesn’t try to muddy the waters. Being direct about this program along with the help of a strong performance by Schoenaerts it all brings the feels, as he delivers so much without saying much. There is a calm beauty to this film, both in its message and in its simplicity that you will enjoy. To me this movie does the two things I enjoy the most, it entertains and informs and you leave the theater feeling a little better about the world than you did before you went it. That is the reason you should see The Mustang and while you are there enjoy the beauty of an animal that has played such an important role in our country’s history.